Technically, this great book isn’t on my shelf any longer. It’s back at the library. I’ve been meaning to write a quick review for a few months now. I first read Elizabeth Moon’s military science fiction, her five-volume series on the intrepid Kylara Vatta. I recommend that, unless you’re completely turned off by anything military. Moon plots very well, knows her science, builds good worlds, and seems to have the authentic whiff of military things. 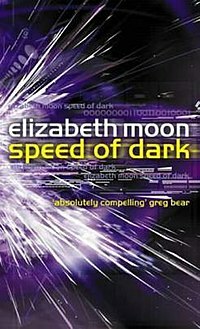 Moon’s 2002 novel Speed of Dark is a significant kick-up from there. Most critics would place it in the top-ten of the decade. I would. Her protagonist, Lou, is an autistic man in a near future in which autism can be cured in early childhood. Unfortunately for Lou, he and his friends are among the last of the untreated autistic people. Lou has choices to make in his personal life, so as a novel the reader is engaged by his challenges and a situation that grows increasingly unclear for him, if not dangerous. This is great science fiction because it presents the reader with a what-if scenario that keeps one thinking long after the last page is read. In this case, what if a condition thought to be an affliction were cured. What about the people who were unable to be cured? What if they had lived their whole life and suddenly they could be treated, but it might change the very nature of who they are? My wife was doing deaf studies a number of years ago. I was intrigued by the deaf culture and after I finished Speed of Dark I wondered what would happen if deafness were curable. If most deaf people opted for hearing, would it devastate a whole human culture? I was also thinking about homosexuality in that light. While some people I know are well-adapted and at peace with their sexual orientation, I’ve known others who weren’t. Suppose they could take a pill and change. I’m sure some people would do it. How would that exodus change the gay culture for those who remain? In the book, Lou is on the receiving end of significant coercion from his employer to undergo the autism treatment. What if a seemingly good thing, like this cure, weren’t so good and moral if applied with a degree of evil? A few years ago, one or two of you asked me what sf I would recommend to people who don’t read sf or don’t think they like it. This book would rocket to the top five of my list of sf books for the un-sf-initiated. And like all great science fiction, this is just a darned good read for all the things a good book provides. This entry was posted in On My Bookshelf, science fiction. Bookmark the permalink. Interesting concept – kind of like that last X-Men movie, where mutants could be “cured” of their mutations. I have a visual impairment and in the world of visually impaired people, there are groups with different feelings about it, just like the deaf people you mentioned. Some people want to do as much with their remaining vision as they can and others want to embrace blindness and learn Braille, etc. In some ways, those who won’t learn Braille (like me) are seen as rejecting their condition. It’s almost as though what was thought of as a disability becomes not a disability to some in order to improve self-esteem? I don’t know – it’s kind of upsetting to try to decide which camp to be in. As far as homosexuality goes, though, that would be different, of course, as that isn’t a “disease” or an impairment. Well said. I just read the book myself (see my review of the book) and I have to agree: this is one of the best science fiction books to recommend to someone who doesn’t read sf. Fortunately at least the copy I have isn’t even labeled as science fiction by the publisher. It would be sad to have someone skip the book just because they don’t read science fiction.